D Ramos Méndez, F Ortega-Mohedano (2017): “The revolution in Millennial’s usage habits and consumption of video in smartphones, the revealed crossroads”. Revista Latina de Comunicación Social, 72, pp. 704 to718. Smartphones are the great exponent of today`s era of mobility and technological connectivity. In this article, we investigate university students´ usage habits and audio-visual products consumption in smartphones. Methodology: Quantitative, a specific questionnaire has been designed and distributed in face to face interviews, supported by a T-CAPI (Tablet and Computer Assisted Personal Interview) constituted by 36 questions-items. Results and discussion: The main differences between the video consumption in 3G and 4G networks are specified in the sample analysed. The tendencies towards intensive video consumption in faster and more powerful networks has been consolidated, as well as an increase in smartphone usage insecond screen activities. Smartphone; video consumer uses and habits, 3G; 4G; audiovisual and networks. In the middle of the XXI century we find ourselves immersed in the Society of Information, Knowledge, Creativity and connected objects. This new communicative paradigm of hyper-connection profiles a technological scenario where the 3G networks that connect it, do not satisfy the demands or standards required by the users nor desired and favoured by the competitive strategies of the audiovisual sector. The most powerful terminals as well as new softwares that require more services from terminals and from the mobile networks themselves which are getting more popular at global level, therefore the evolution of the consolidated scenario of 3G broadband in OCDE countries is mandatory, especially in the European Union, for the years to come. In this research, we analyse the video consumption in smartphones in a time cycle of acceleration and transformation of the technological, economic and social paradigm. The natural evolution in connectivity in networks that influences these devices is the implantation of 4G/4G+ and the projected 5G networks. This technological evolution is enabling to widen and multiply the speed and coverage of the networks 2G and 3G in obsolescence, offering users, through the chain of audiovisual value, enhanced user qualities and experiences in the visualization of audiovisual products such as improvements in the product-service, download of contents of greater quality and size, that the online consumption in streaming can be done in almost-real time, that the massive storage in the cloud and that the exchange of heavier files among users could be stable and fast. In short, that the connectivity-communication between devices could be immediate, stable and ubiquitous. These renewed technological characteristics in networks and equipment allow users the possibility of choosing between different alternatives according to their final preferences. A user with an inferior network will be forced to view contents in a low resolution that require less speed and data download volume in formats of lower resolution such as 360p or 480p proportions, however, a user with a 4G/4G+ connectivity has the possibility in his consumption, of viewing at high resolution such as HD, 2K or 4K, even though the final download volume in bits would increase considerably. The advantages of the new 4G/4G+ networks do not only favour the full connectivity between devices, but they also optimize the use of the audiovisual scope, associated energetic consumptions, final connectivity in buildings and the potential interference with physical installations and living beings using them intensively. The development of the mobile broadband network in our socio-economical context, as well as the development of the associated terminals has not reached the ceiling in this first extended decade of the XXI century. It is foreseeable that in the 2017-2021 five-year period the development of 4G/4G+ networks could exponentially increase towards the establishment of 5G enabling the fully activation of Internet of things and better speed and quality in connectivity. While the high-speed connectivity is developed in our environment, this is accompanied pari passu or even surpassed by the offer of devices of visualization in mobility with better services and equipped with full capacity of audiovisual reproduction in high definition and 3D. The arrival of fifth generation network, currently under testing, promises to multiply the uploading and downloading speeds of current networks as well as reducing the lag between connections. It is foreseeable the that network operators would like to amortize the investment on baseline stations and antennae of the 4G networks before implanting the 5G network so that this transition could be as efficient as possible in terms of profitability, however, it is true that the expected saturation of users demands and the European legislation related with the implantation of 5G networks could accelerate said transition. In the last two years, the penetration of mobile lines in Spain has increased up to an average of 109.9 lines every 100 individuals (2.3 million lines more than 2014) with a mainly social consumption focused on activities related with connectivity such as instant messaging, social networks, videocalls, etc. (CNMC, 2016). Video visualization habits in the countries of our socioeconomic context are also evolving, influenced by the exponential increase of contents providers and a greater diversity of audiovisual content available in any moment, place and device. The audience in revolution is facing an extended programmatic offer, diverse and customizable where its preferences are satisfied almost immediately and in advance thanks to the advanced analyses of Big Data. The public in revolution demands each time a more diverse and specialized programming, on demand, multiscreen, multidevice, flexible and if possible, of quality at the most convenient price. This renewed user, mainly young, does an intensive and compulsive consumption using VoD-Video on Demand-Video services on demand or through OTT-Over the Top contents distribution, mostly in smart and customizable devices (Ortega, 2015). While audiences evolve towards a pro-broadcasting model which converges in service platforms such as Netflix, Amazon, Movistar+, among others, the traditional television model is being abandoned progressively, facing a hybrid consumption that combines elements of both scenarios (Scolari, 2015). Smartphones are destined to be the Vygostkian tool that transforms everything and the nexus between the modern and traditional scenario (Kormelink and Meijer, 2014), as well as the screens where research on communication will place part of its centrality and new research lines. In our research, we analyse the usage and consumption habits of the young-university population in the city of Salamanca, which corresponds grosso modo with population ranges assigned to the Generation Y or Millennials (born between 1980 up to 1992), and Generation Z (born after the year 1992). Millennials are the generation that access the network longer, with activities targeted mainly to tasks related with the consumption of audiovisuals, mostly products-services associated to video and/ or photographs in the extensive sense of the word and checking social networks and instant messages services. The differences between usage and consumption habits among Generation Y and Z progressively converge in the quantitative indicators of penetration of smartphones and Internet access, moreover they are more and more similar regarding time of usage and activities performed through the device. There are also huge differences between the two generations in habits related with the dependency on its terminal, being for Millennialsan element which they will feel lost without. This is mainly because this generation has evolved in its preferences of consumption and usage with terminals that noticeably renewed with significative technological innovations every two years. This characteristic of the market made life cycles of smartphones shorter compared to the current last generation devices where the average renewal time increases to three years. In this sense, the need for update is more mandatory in the Generation Z requiring its terminals to be more powerful and compliant with the last trends of the markets as a consequence of production and marketing campaigns of terminal manufacturers, which create the need to get a better terminal through the improvement of their services, creating more complete and heavier operative systems that are not implemented or compatible with specific applications-services or by promoting marketing campaigns that try to make population loyal to their products. Millennials are more acquainted with this typology of consumption, somewhat influenced by generally having a greater economic level than Generation Z, younger and presumably with lesser professional baggage. The forms of entertainment of Generation Z are very related to consumption and usage of the terminal compared to the previous one, being their smartphone their main source of entertainment, at the same time they also think of it as a vital element of their social life. Both generations use the Smartphone as a tool for searching information, purchasing and selling products and services. The younger the user, the greater multiscreen consumption in the sense of a consumption fragmented in different devices and, on the other hand, consumption in second screen that is, while consuming television through the television or computer, the user can be browsing with his smartphone, tablet or vice versa. It is necessary to specify that the access routes to the audiovisual are wide and almost measureless in the complex distribution of access to contents in Internet, coming from multiples routes such as browsers, specialized websites, mass media websites, blogs, link pages and a long etc. We can have access to many brands or media with audiovisual contents through different platforms depending on the use we make of them. As a star case, YouTube can be simultaneously considered a social network, a browser, a website or an application depending on its usage from users and a mass media can have its own website, application or profile in a social network as well so that the user has multiple access routes to contents. On the other hand, in general terms, in the visits to websites of television channels through the computer, smart TV, smartphone and tablet, viewers have stablished a relationship of reinforcement between the contents broadcasted in the traditional television and the digital access of contents through web or application. This relationship between media and visualization channels enables a continued consumption of contents of different genres, adding the consumers’ capacity to regulate their own audiovisual grid by accessing online contents, however, the web viewing in smartphones is making way to viewing through applications of social networks, messaging or video applications. Social networks have turned into references of access to audiovisual contents. Through these communication platforms of global communication, users can access to a practically unlimited content through the exchange of contents from users and references inserted therein. At a global level, almost three-fourths of users that consume videos on the network, access them through social platforms or networking and half of them directly through their social network (Ofcom, 2016). In this study, we will consider the social network from a restrictive perspective, since we do not include some applications or platforms that lead to social consumption such as WhatsApp but that from the audiovisual perspective they have different profiles. Among all activities performed by users on social networks, visualization of videos in social networks has become one of its main uses, driven at a great extent by the increase of popularity and development of these portals at the same time networks implement mechanisms for the visualization of videos in their own platform. These configure as an essential element in the knowledge of the present and as platform for exchanging information, and even more today with the incorporation of streaming services such as FacebookLive, where both users and websites can broadcast videos and records live and which have turned into a trend in a very short time since its launching in the national market. They are also the third platform behind messaging services and video applications in data consumption, being able to reach the flow of at least 1Gb (with two or three views daily), without considering the processes of video uploading, reproduction or exchange (Ericsson, 2016). Applications of instant messaging are in the lead of consumption in smartphones, strongly bursting in the audiovisual consumption and turning into a usual means to comment audiovisual contents with the friends’ network. The feeling of privacy that this tool provides and the possibility to create groups is drawing the most relevant conversations about television to a considerable extent. In this study, we consider that the function is different in these platforms so that the exchange of information has a more private character and consequently, more restrictive and less informational compared to social networks. Both the traffic time and the exchanged data volume in these platforms will influence the amount of video consumed by users and will be interesting to confirm results in relation to the form of consumptions since current market reports do not have detailed information available on audiovisuals consumed through instant messaging, although the basis about traffic data and data volume is quite extensive. The software developed for smartphones in the form of applications have become more popular among audiovisual consumers between entertainment, infantile, communication and business applications. These applications vary in popularity depending on interests and preferences among the different brands through downloading platforms such as AppStore in IOS and PlayStore in Android System. Through them, individuals look for online and updated audiovisual content they can consume on their phones or through them by connecting them to a screen of larger format. They also mean an element of loyalty or continuity with the television grid: so that contents that couldn’t be viewed in the traditional broadcast or the streaming could be recovered, as well as previews, trailers, or parallel and exclusive information of videos so that they become an element that reinforces the relationship between the traditional television and the online consumption. Half of smartphone users download applications related with the video on their terminals without using applications that are already installed by default in their operative system such as YouTube in Android terminals since it was purchased by Google in 2006. The main reason to download them are mainly convenience of access, speed of access to information, getting more significative contents or by loyalty towards a brand (AIMC, 2016). Mass media have also been incorporating through applications that allowed accessing their contents via streaming or VoD. Currently, we have a media applications grid that is the same or greater than that of the television, however, in 2015 the consumption of media in applications was not configured as one of the majoritarian uses in smartphones. Compared to most applications of free consumption, paid– pay per subscription applications are increasing in popularity after the enforcement of restrictive and sanctioning policies to piracy services, which even though they are still very popular, their use is reduced in smartphones because a professionalization and specialization in the functioning of devices is necessary for the use and consumption of illegal contents. To a great extent, the reduction of subscription prices and the inclusion of these paid services in the operator packs, have influenced in the popularization of these platforms consumption. Second screen applications enable the user to interact with what he is looking at the television at that moment. These applications are not usually compatible with the video consumption in smartphones since it is necessary to exit an application to get into another one, so visualization would be interrupted, even though there are last generation terminals that allow simultaneous multiplied consumption in the same screen. These devices require a quality screen of a considerable size to enjoy the contents. It is worth mentioning, the presence of this kind of applications in the market and its relevance in the multiscreen consumption while enriching the audiovisual consumption. 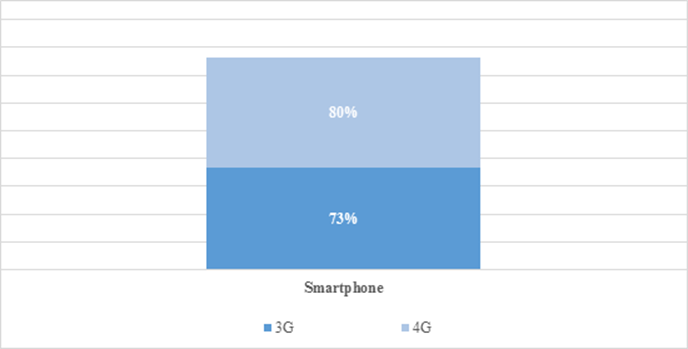 In this article, we analyse the usage and consumption habits in tablets and smartphones by investigating the uses and consumptions of 3G and 4G networks to know the significative differences there might be. With this purpose, we designed a questionnaire that was distributed through face to face interviews with the support of a T-CAPI (Tablet and Computer Assisted Personal Interview) comprised of 36 questions-items available in https://goo.gl/Zn9DFN. A total of 306 individualized interviews were done among the target object of study. The n sample was randomly selected in the Campus Unamuno of Universidad de Salamanca in the Graduate studies of Audiovisual Communication, Sociology, Social Work, Philosophy and Business Management and Administration, and in the Faculty of Education in the graduate studies of Pedagogy and Social Education, and in the Faculty of Sciences in the graduate studies of Computing Engineering. Interviews were carried out in April and May 2015. The valid randomized final sample was n=303 students from a total target population size of N= 31.846 students of the Universidad de Salamanca in the year 2016, with a confidence level of the sample of 95% with an error of +-5% for finite populations. For the specific study in 3G and 4G networks, we requested participants to specify their terminal model to know its compatibility with the specified networks. The market share of Spain operators is similar among the university target and the aggregate of clients. Hypothesis contrasted in questionnaire items P7, P8, P9 and P10. The Smartphone is the device with greater penetration in the university target. Hypothesis contrasted in questionnaire items P11 and P12. The university student has an intensive audiovisual consumption profile (more than 4 hours of visualization of audiovisuals per day). Hypothesis contrasted in questionnaire items P13, P14, P15, P16, P18, P19, P20, P21, P22, P23, P24, P25, P27 P31 and P32. The Smartphone is the main device for visualizing audiovisuals of short-to-middle duration (0-15 minutes). Hypothesis contrasted in questionnaire items P26 and P28. The consumption of audiovisuals in Smartphones with 4G connection will be higher than 3G devices. Hypothesis contrasted in items P17, P24.P28, P29. The consumer shows preferences in the use of wireless fixed networks compared to mobile broadband networks. Contrasted in items P33, P34 and P35. Complementary, platforms of contents distribution were identified where there is more consumption of advertisement in video and multiscreen-multidevice usage habits (items P35i and P36 of questionnaire, and items 29 and 30 respectively). As follows, we present the results of contrasted hypothesis. Our research has confirmed that the daily audiovisual consumption among the Millennials target users is greater in those having 4G networks compared to those with 3G networks, with a difference in percentage of 7 points as we show in the following graph. 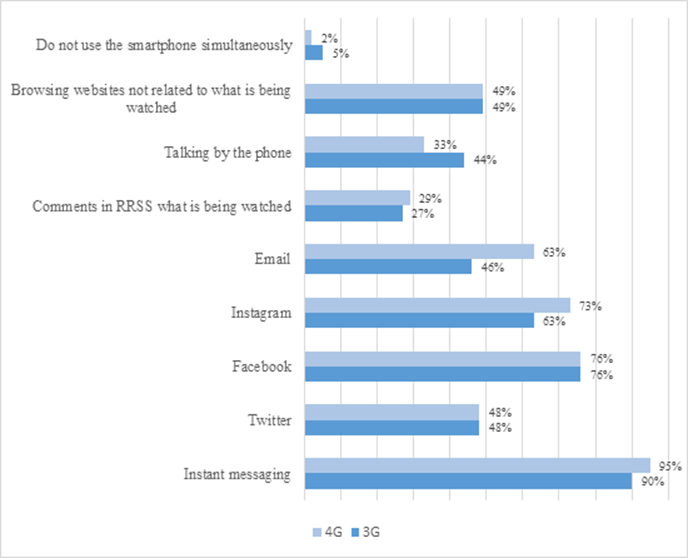 Graph 1: Audiovisual Consumption in Smartphones in 3G and 4G networks among Millennials. We have detected differences consumption patterns between consumers who have more than six applications installed for audiovisual consumption, with a positive relationship among users with more applications and 4G connectivity in their devices, in short, the better data connection, the greater number of applications for video consumption that Millennials have installed on their devices. The platforms and applications preferred by users with 4G connectivity for video consumption are, in a more to lesser order, YouTube, social networks and message applications where they consume and share video, followed by video websites, free apps and lastly, paid apps for audiovisual consumption. Regarding the typology of the short pieces of video or “clips” consumed mainly in the smartphone, we have identified what kind of audiovisuals are consumed mostly in the different networks so that we can detect whether an increase in broadband influences the audiovisual consumption and their duration. 4G networks in terminals should favour visualization of clips of longer duration among Millennial consumers. Let’s see the conclusive results obtained. The analysis of clips of shorter duration, identified in our questionnaire with the following categories: micro videos, video clips, informative clips, educative-training clips, short series and short films. We have identified a greater consumption in users with 4G of informative contents and short series, with a 5% and 11% superior respectively. There are no relevant differences in the consumption habits in videos from the short film and micro-videos typology. The consumption of music and video-clips, as well as educative-training contents is superior in users with 3G compared to 4G network in 14 and 6 percent points respectively. Graph 2. Consumption of Videos with a short to middle duration in 3G and 4G networks. Source: Authors own creation from the study data. Regarding videos of longer duration, we categorize the television programs, movies, long series, sports, live retransmissions and documentaries. In these audiovisual products of longer duration we have detected significant differences in the consumption in terminals with 4G and 3G connection. In all categories, 4G terminals are significantly superior to consumptions in 3G terminals, except for television programs, as can be seen on Graph 3. Documentaries, live retransmissions, sports, long series and movies, Millennial users consider that 4G are more suitable for viewing these contents that need a more stable connection and broadband, since most of them are broadcasted in standards near to High Definition standard, HD and even 4K in some platforms of distribution in streaming for these devices. Predictably, this difference could be increased with the progressive development of 4G/4G+ networks and even more with 5G. Graph 3. Differences in the consumption of long videos in 3G and 4G networks. Source: Authors’ own creation from the study data. Regarding the multiscreen consumption, we have seen differences in the preferences associated to the consumption in second screen in smartphones. Firstly, users with 3G networks use the smartphone less simultaneously when it comes to consuming television in the traditional device (5% against 2%) but prefer to use it to talk by the pone while they watch television simultaneously (44% against 33%). Browsing of social networks is similar in both cases except in the case of Instagram, a social network closer to audiovisual (image and video in this case) than Facebook or Twitter. The website browsing values in both networks coincide as well. We have detected that there seems to be a greater use among 4G users in checking email, as well as the social network Instagram, probably associated to the better visualization quality of 4G devices compared to the more obsolescence hardware generation associated to 3G devices, as shown on Graph 4. The simultaneous usage habits in the smartphone show differences among users who do not perform any simultaneous activity at all. In this case, 4G users who champion the exclusive use of the terminal (11%), with a difference of three percent points compared to 3G users. 3G users would favour more the fact of consuming audiovisuals on their smartphones while eating (59% against 47% of 4G), cooking (29% against 24% of 4G) or doing sports (14% against 12% of 4G). In the rest of categorized activities, such as waiting, buying, reading, studying, going to the bathroom, using the tablet, using the computer or watching television, the number of 4G users that perform them simultaneously is higher compared to 3G. We do find greater differences in performing simultaneous activities in the practice of social activities (25% of 4G against 2% of 3G), listening to music (29% against 32% of 3G) and driving a means of transport (only done by those with a 4G terminal). There would exist a positive correlation between having a 4G terminal and performing simultaneous activities with a more intensive audiovisual or technological component regarding data and attention to these devices screens. Graph 4. Simultaneousness of activities in smartphones and TV consumption. The consumption of videos increases in a proportionally inverse manner to the duration of videos, in other words, the shorter duration of videos, users consume more in mobile terminals. This conclusion coincides mainly in those audiovisual pieces with an approximate duration of zero to five minutes and which do not have, initially, a high demand of quality and/ or associated bytes. Music videoclips and micro-videos are the only unique pieces where smartphones are the devices used mostly for their visualization, however, we found competence between this and other devices such as television and the computer in contents of approximately 15 minutes of duration like short series, informative contents and educative-training contents. This research leads us to build the following profile of usage and consumption habits in the target user analysed. We have contrasted that the market share of operators in Spain is similar between the university target and the aggregated clients, however the case of Yoigo (still not absorbed by MásMóvil in the moment of the research) shows a slight difference on weighing of 6.6% in the sample (H1a confirmed). The Smartphone has not yet reached the penetration shares of the laptop or the desk computer (H1b not confirmed). The university student uses both devices as a leisure, work and study tool. They do not only have more individual computers, but many of them have several computers per person instead, while in the case of the Smartphone, even though there are also users who own several, it doesn’t reach up to the level of computers, nevertheless, this difference will reduce exponentially. Regarding usage and consumption habits the profile of intensive consumption of participants is confirmed, being an intensive use of more than 4 hours of audiovisual visualizations per day (H2a). This consumption will mainly focus between 9 in the evening and 12 at night in the traditional night prime time slot. We have verified that approximately half of smartphone users pay for the access to audiovisuals from this device, which is influenced, at a great extent, by the growth of VoD as well as the cheapening of the cost of service and the implantation of repressive policies towards piracy. We could observe that as we reduce the duration of videos, there is an increase of consumption, however, this only happens in those audiovisual pieces with an approximate duration of 0-5 minutes besides being those that do not need a powerful video quality to be visualized in a comfortable manner. Music videoclips and micro-videos are the only pieces where the smartphones are the devices mostly used for visualization, even though we found competence between this one and the Television and the Computer in contents of approximately 15 minutes such as short series, informative content and educative-training contents (H2b partially confirmed). There is not a huge difference in the consumption in both networks, but there are trends towards a greater consumption in audiovisuals in 4G terminals with a duration longer than half an hour such as movies, long series, documentaries and retransmissions. They also present a greater preference towards the downloading of video applications in their devices in mobility compared to 3G users. The activity in second screen and simultaneity is greater among 4G users even though the rest of usage and consumption patterns in both networks does not show very significant difference between both. All users have similar usage and consumption patterns, even though the immediacy of connectivity of networks of more capacity and speed causes consumptions to be more intensive in terms of duration time and audiovisual quality of what is being viewed. Those users with more obsolescence devices and/ or lower connectivity, consume with similar patterns but lighter audiovisual products in bytes. There are also differenced patterns that would prioritize the use of wireless fixed networks compared to mobile broadband networks (H2d confirmed), mainly associated to the gratuitousness of the former and the limitation in data downloading of the latter. The consumption of advertisement in smartphones is mainly focused on free platforms, where we could include YouTube and the different social networks, being also higher the consumption of advertisement in these due to the greater number of users compared to the rest of platforms. Therefore, we determine that the paid platforms entail the best alternative for those who consider the consumption in advertisement as an important negative handicap. The penetration of paid and free audiovisual providers multidevice and multiscreen in this target (in our country mainly associated to providers such as Netflix, Yomvi-Movistar+, Amazon, Wuaki, Atresmedia, Mediaset y CRTVE among others) revolutionizes the when, where, how and with whom the generation we have investigated here, consumes audiovisual contents and carries out multidevice and multiscreen tasks. These consumptions will consolidate in these mobility devices in the next years. We have detected the changes and emerging evolutions in the usage and consumption habits in the young generation in our country. The identification of the most significant differential patterns in the necessary technological revolution in connectivity and equipment and consumer’s habits is needed to allow the audiovisual, cultural and entertaining industry of our sociocultural context to adapt to the App-revolution (ORTEGA ET AL, 2015) which is already here to stay and revolutionize this sector. These new research lines must be studied with methodologies and complementary and representative samples not only in the age target we studied, but also other targets and the whole population instead. Transnational and case studies seem necessary to delve in the understanding of processes and renewed implications in these new spaces of usage and consumption among all consumers. Our research contributes with a relevant documented reflection for the corpus of knowledge about the usage and consumption habits of new audiences. These research lines will be necessarily complemented in future researches, with methods, tools and micro and macro approaches to evaluate, study, know and describe the state of the art and the consolidating trends. The scientific analysis of data will keep helping us to make better grounded recommendations and oriented towards the complete audiovisual value chain. Only this way, we can walk with the clairvoyance of tools and methods that the Society of Knowledge, Information and Creativity has available for us. We navigate in the uncertainty of an audience in revolution that transforms its audiovisual usages and consumptions and that faces an ultrafast ecosystem of connectivity with the arrival of 5G. We will keep working on these waters of prevision and prospective. A.J. Murphy, C.R.Nokes, & BBC. (2015). 4G broadcast: Can LTE eMBMS help address the demand for mobile video? Research & Development. Adelantado, E., & Martí, J. (2011). Contenidos audiovisuales y televisivos para dispositivos móviles: Una aproximación al mercado español. Adcomunica, 1, 99-113. Aguaded Gómez, J. I. (2014). Nuevo modelo de enseñanza europeo a través del prosumidor infantil televisivo. Comunicación y Hombre, 10. Aguilar Vacas, F. (2007). Mobile telephony: The fourth window. Zer, 23. Carat. (2016). Tendencias para una audiencia cómoda que quiere consumir de forma sencilla (Tendencias 2016). Carat. (2015). ¿En tu pantalla o en la mía? (Estudio Ccs -Consumer Connection System-). Carrera María, D. (2011). Vovo. Universidad Carlos III de Madrid. Máster en Dirección de la Empresa Audiovisual. Comes Agustí, Ramón et al. (2010). LTE: Nuevas tendencias en comunicaciones móviles. Fundación Vodafone España. Comisión Europea. (2016). Informe sobre España 2016, con un examen exhaustivo relativo a la prevención y la corrección de los desequilibrios macroeconómicos.Documento De Trabajo De Los Servicios De La Comisión, 78. Daleine Suspens, K. (2012). Kibhat daleine suspens1.Revista Digital De Las Tecnologías De La Información y Las Comunicaciones, 11, 1-10. Deloitte. (2015). Deloitte mobile consumer survey. Principales conclusiones en España. Recuperado de: http://www2.deloitte.com/content/dam/Deloitte/es/Documents/tecnologia-media-telecomunicaciones/Deloitte_ES_TMT_Consumo-Movil-2015.pdf. Escobar, M. C. (2010). La próxima generación de telefonía móvil 4G: Lte y WiMAX, estado del arte. Telecos e Innovación, 77-83. Iab. (2016). 2015 Digital Content NewFronts: video ad spend study. 2016 Newfronts. J. Martínez, I., & Aguado, J. M. (2006). El desarrollo de la telefonía móvil como plataformas mediática. Unlz, 5, 21-39. López, F. (2015). Netflix, un análisis preliminar de su entrada en el mercado español Burson-Marsteller. Mata González, M. (2012). La telefonía móvil: El impacto social (Tesis Doctoral, Universidad Politécnica de Madrid, 2012). Mauricio, E., & Ortega, I. La telefonía móvil de cuarta generación 4G y Long Term Evolution. Ingenius. MillwardBrown. (2015). Video creative in a digital world, global report. Adreaction. Ministerio de hacienda y Administraciones públicas. (2014). Planes específicos de la agenda digital para España. Real Decreto 458/2011 de 1 De Abril, sobre actuaciones en materia de espectro radioeléctrico para el desarrollo de la sociedad digital. 5936, (2011). Online Business School. (2015). Análisis de las tendencias de Uso y participación en las redes sociales a nivel mundial en España. OBS Social 2015. Ontsi. (2015). Análisis sectorial de la implantación de las TIC en las empresas españolas. E-Pyme 2015. Ontsi. (2016). Estudio de demanda y uso de servicios de telecomunicaciones y sociedad de la información. Las TIC en los hogares españoles. Ortega,F., González Ispierto, B, Pérez Peláez, ME (2015): Audiencias en revolución, usos y consumos de las aplicaciones de los medios de comunicación en tabletas y teléfonos inteligentes. Revista Latina de Comunicación Social, 70, pp. 627 a 651. Scolari, C. A. (Ed.). (2015). Ecología de los medios: entornos, evoluciones e interpretaciones. Editorial Gedisa. Groot Kormelink, T., & Costera Meijer, I. (2014). Tailor-Made News: Meeting the demands of news users on mobile and social media. Journalism Studies, 15(5), 632-641. Article received on 1 on May 2017. Accepted on 23 June. Published on 24 June 2017.